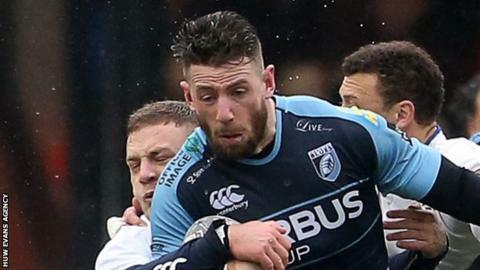 Cardiff Blues wing Alex Cuthbert is to miss Wales' three-Test June tour to New Zealand because of injury. The 25-year old was already out with a heel injury and will be sidelined for 12 weeks after electing to have surgery on a knee problem. Blues head coach Danny Wilson said: "Alex will be disappointed to miss the end of this season and the chance to go on the summer tour with Wales. "However, this decision has been taken for his long-term health." Cuthbert has scored 15 tries in 42 Wales appearances, one for the British and Irish Lions in a Test and 37 in 79 Blues games. He is out of contract with Blues and the end of the 2015-16 season. Cuthbert's injury absence means if he does not sign a fresh deal, he may have played his last game for the region. He turned down offers to leave the Blues before agreeing his current deal in 2012.